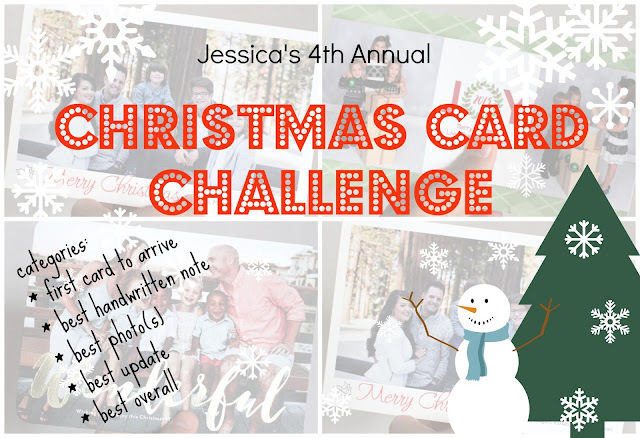 I can't believe that the FOURTH year of my christmas card challenge is upon us. I love sending and receiving christmas cards. I love displaying cards and notes from friends and family near and far. I love how with a simple card, I can reminisce on fun times I had with those people. I love hearing how people are doing and watching their kids grow from year to year. It is because of all this, that I started the christmas card challenge. It's a fun way for me to bring a little cheer to the "christmas card" season. Believe it or not, the first card to arrive category has already been secured. One of my friends is super on her game and it arrived last week. It put a huge smile on my face and reminded me that I need to go search out my christmas card holder and figure out where I am going to hang it in the new house. Again this year, I will be giving out a bag of Bean Counter Coffee Roasters coffee to the winner. How it works is, after Christmas, I will choose a winner from each category, then use a random number generator to pick the winner. If you want to join in the fun, but don't have my address, feel free to email me at jgrimbleby(at)gmail.com and I will tell you where to send it. And if you are looking for some inspiration, here are the winners in years past - 2015, 2014 and 2013. I will say, I still love the trend of doing little updates of each kid on the back of the card...hint, hint.